Hays High just kept pounding away at the Liberal Redskins and eventually wore them down in a 30-7 win at Lewis Field in Hays Friday night. The Liberal defense was on the field most of the night at Liberal’s no huddle offense was inconsistent and only ran for 49 yards. Hays built a 14-0 lead after their quarterback Austin Unrein capped a 12 play drive with a six yard touchdown at the 4:24 mark. Unrein used play action to hook up with Adam Deterling for a 29 yard TD and it was 14-0 with 4:04 to play in the first half after Hays went for two and got it. Liberal scored just before half when Slader McVey tossed a jump ball for 6’5″ Jade Cathey who caught it at the five and took it in for a 25 yard touchdown with 41 second remaining in the first half. It was 14-7 at halftime. After Liberal held the Indians in the second half, an LHS fumble gave Hays the ball on the Liberal nine. Hays would have to settle for an Unrein 22 yard field goal to make it 17-7. But as Hays pounded away at Liberal for short gains most of the night, it was apparent the LHS defense was on the field too long when it was the fourth quarter. Casey Sedbrook busted off a 41 yard touchdown part of his 151 yard rushing night. He added a 12 yard scorewith 7:56 to go. Hays amassed 315 rushing yards and 357 total yards to Liberal’s 235 yards. Hays didn’t turn the ball over and Liberal comitted two turnovers resulting in three points. Liberal loses for just the second time since 1990 at Hays and falls to 2-1 and 0-1 in the WAC while Ryan Cornelsen’s Indians are 3-0 and 10-2 under his guidance in his second year. Cornelsen graduated from LHS in 1997. 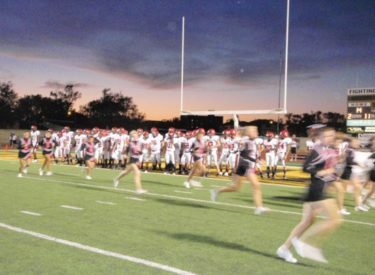 Liberal hosts 3-0 Dodge City Friday on Talkradio 1270 and kscbnews.net.